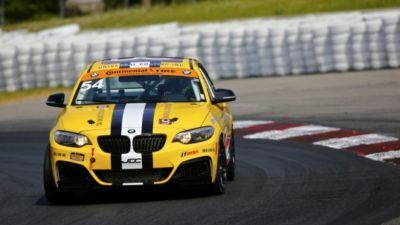 BOWMANVILLE, ONTARIO, CANADA (July 7, 2017) – American paralyzed BMW driver Michael Johnson is back-to-back with opening practice today in the IMSA Continental Tire SportsCar Challenge at Canadian Tire Motorsport Park. The 2.459-mile, 10-turn road course, is on the heels of Johnson’s race last weekend in upstate New York. The JDC-Miller Motorsports pilot will tackle Canada’s first purpose-built road course previously known as MoSport International Raceway. Official practice begins Fri., July 7 at 10:00 a.m., with qualifying at 8:30 a.m. on Sat., July 8. The race will be held on Sat. afternoon beginning at 2:50 p.m. for the Canadian Tire Motorsports Park 120. The race is timed with a two-hour window. All times Eastern. The race will be televised on a tape-delayed basis by FOX Sports, and but will be streamed, live, on IMSA.com. Johnson is of course paired with teammate Stephen Simpson, from Cape Town, South Africa, in the Street Tuner (ST) class. Johnson’s car is specially equipped with hand controls, provided by GuidoSimplex, due to his paralysis. Johnson’s car features a complicated brake, gearshift and throttle system, with which Johnson uses his hands to control systems other drivers manipulate with their feet.